In a large bowl, place warm milk, yeast and sugar and whisk until sugar is dissolved. Set aside for about 5 minutes to let it proof. In a small bowl, mix together the eggs and butter. Pour egg mixture into milk mixture and mix well. In a another large bowl, mix all-purpose flour, whole wheat flour, and salt until combined. With a large wooden spoon, or spatula, begin pouring flour mixture a little at a time into the wet ingredients, folding as you go and combining well before adding more flour mixture. Keep adding flour until the dough starts to pull away from the sides of the bowl and is soft and smooth. Begin using your hands once the dough starts to come together, and knead in bowl until the dough is the right consistency. Tip: Do not over-flour the dough. You may not even use the entire flour mixture. The dough should be soft, smooth and slightly sticky. Next, transfer the dough to a large, greased pot with lid, cover, and put in a warm, draft-free place to let rise for about an hour. Tip: I preheat my oven to 100 degrees fahrenheit and then turn it off but leave the oven light on and put the dough in the oven. This is the perfect place to let dough rise. After an hour, remove the dough from the pot and place on a lightly floured surface. Punch down the dough and roll out to about 1/2 inch thickness. 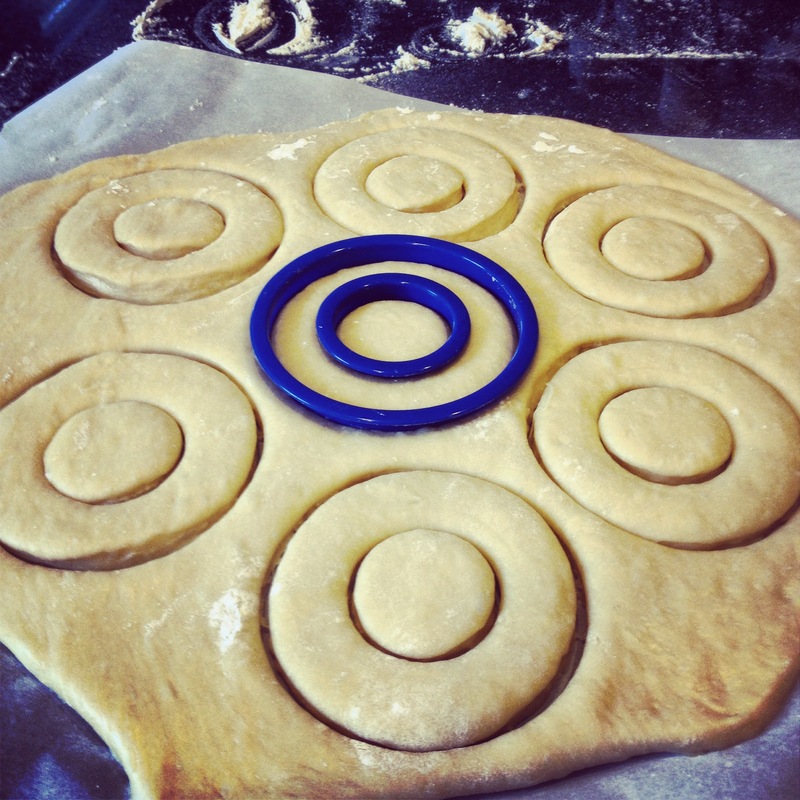 With your large, round cookie cutter, cut out circles in the dough. Then, with the smaller cookie cutter, cut out the inner circles (the doughnut holes!). Very carefully, transfer the doughnuts to one parchment lined baking sheet and the doughnut holes to another. Cover both trays lightly with plastic wrap and let rise again for about 45 min. After they have almost doubled in size, preheat oven to 375 degrees fahrenheit. Remove plastic wrap and bake doughnuts and holes for 8-9 minutes. Remove from oven and let cool on a wire rack. Place the chopped chocolate in a medium sized, heat proof bowl and set aside. Heat the cream and butter in a small saucepan over medium heat. Bring just to a boil. Immediately pour the cream over the chocolate and let stand for 1 minute without stirring. Then, stir gently with a spoon until chocolate is melted and smooth. 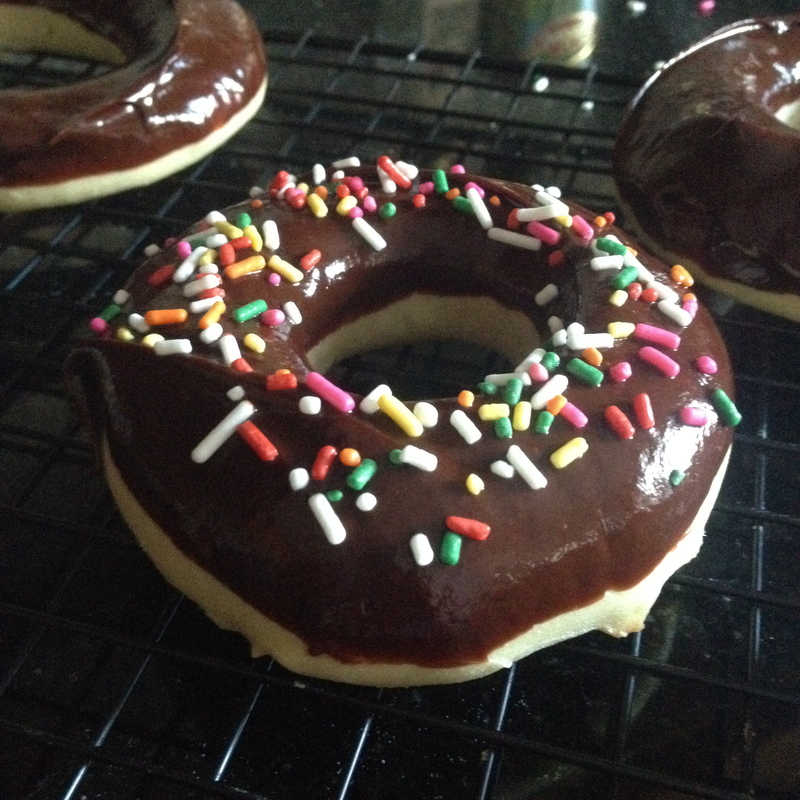 Dip the tops of the doughnuts in the chocolate and place them back on a wire rack. Immediately sprinkle with sprinkles, then let sit for a few minutes for the chocolate to cool and harden before taking a bite. Enjoy! Great job, Emily. The doughnuts look mouth watering!